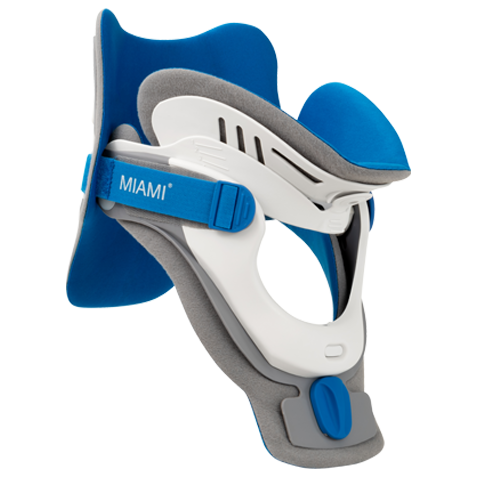 The Miami J Select cervical collar by Össur offers the widest range of height adjustability in the market with a single, universal design that replicates the comfort, immobilization and quality you expect from a Miami J product. Featuring a patented, first-to-market locking mechanism to encourage patient compliance and Anti-microbial Sorbatex™ padding, Miami J Select is designed to support successful patient outcomes. When desired position is attained, engage the Patient Compliance Lockout located behind the Height Adjustment Button by moving the lever to the left. Either on or off the patient, the easy to use manual height adjustment allows to raise or lower the chin support. Anti-microbial Sorbatex™ - Treated with SilverPlus® to control bacterial growth, reducing bacteria count by over 99% under ISO 20743 testing. The use of the repeatable fit straps allows for the collar to bet fit to the right size and securing the back panel to the hook landing areas on the front.